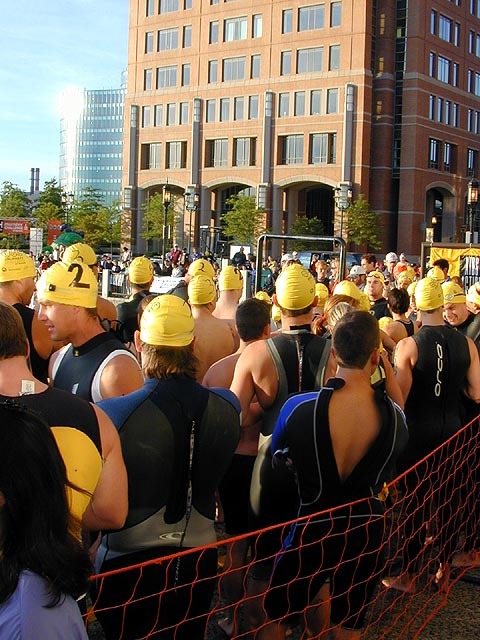 i snapped awake at 6am so i could go see eliza compete in her second monster.com triathlon. i remember ed and dan paquin doing it back at srm, and i remember seeing the photos of all the yellow heads bobbing in boston harbor. "it's early," she warned me yesterday on the phone when i asked her when the race was starting. 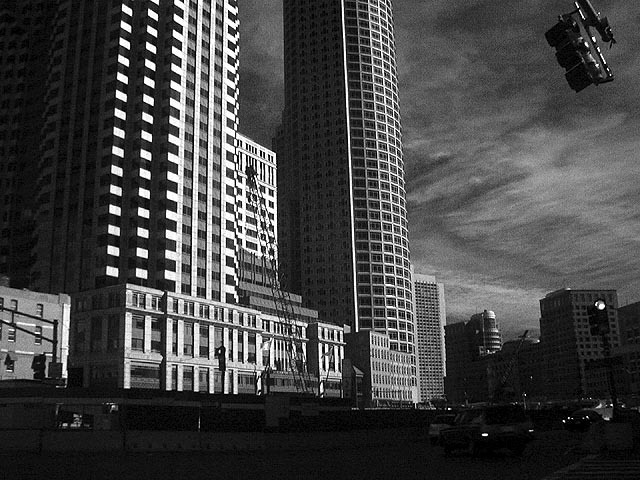 early apparently meant 7am down at the world trade center in boston. i miscalculated, didn't take into account the distance between south station and the location of the triathlon. as soon as i got into boston, i had to run down to the world trade center in order to make it in time for the race. 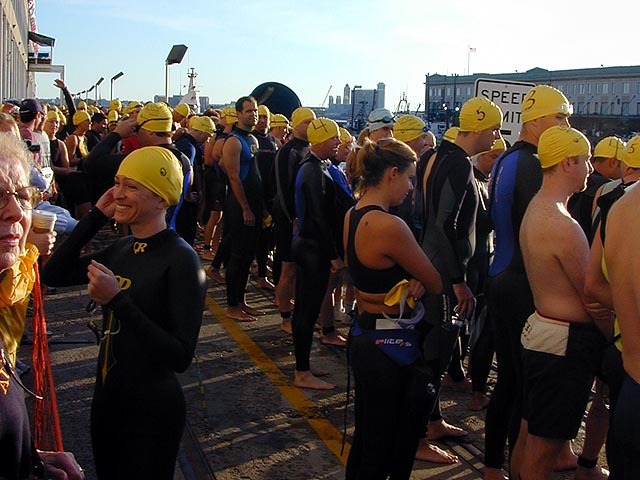 by the time i got there, all the swimmers were already lined up in their wetsuit and yellow swimcap, ready to walk down the dock and into the cold boston harbor for the swim leg of the triathlon. i spotted eliza waiting in line, we chatted briefly before i let her go and went to find a good vantage point to shoot some photos. 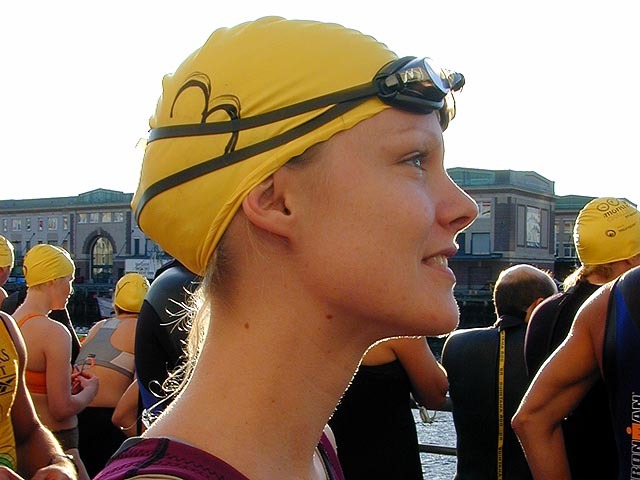 the first leg of the triathlon involves swimming the boston harbor, which sounds harder than it actually is: in my mind i pictured a sea of people swimming the whole expanse of the harbor, miles and miles of water to traverse. in reality, swimmers just go around the perimeter of the world trade center, which is still a good distance, but nothing like i imagined. i got myself in a corner overlooking the water and waited for eliza's heat (identified by the number 3 on their caps) to swim by. soon afterwards eliza plowed by, doing the backstroke. "eliza!" i shouted, waving one hand and taking photos with the other. a woman watching next to me turned and said, "eliza? where? how do you know eliza? are you tony?" turned out it was her mother and her mother's boyfriend, here to see eliza compete. i followed them as we went around the perimeter of water, tracking eliza who was swimming down below. 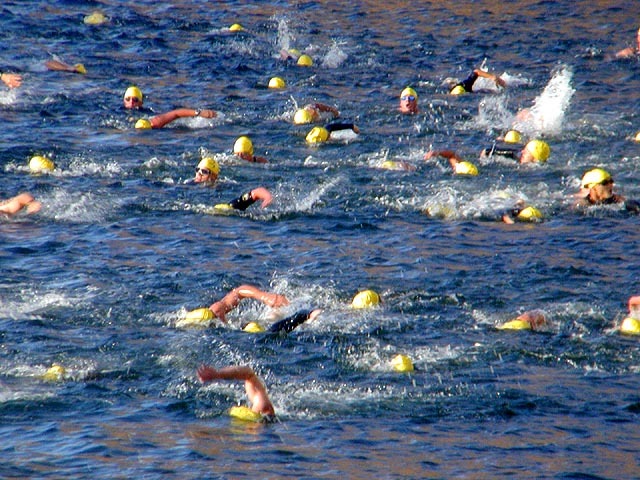 we waited at the exit of the swim leg, as swimmers one by one ran out of the water and quickly onto their bicycle for the biking leg of the triathlon. i met eliza's father, who was waiting there hoping to catch a glimpse of eliza as she transitioned. after a few long minutes it was apparent that we had missed her, so i went with eliza's mother and boyfriend to the start of the bike route, hoping to see eliza there. i had my back turned, that's when eliza's mother and boyfriend gave me the slip. i wandered around a bit, and found myself at the end of the bike leg, where i saw eliza come in on her mother's bike. the final leg was the running, i called out eliza's name when she ran by me. by that time some people were already finishing the race. triathletes are a weird lot. their bodies aren't shaped like marathon runners, they're not bone skinny. they're not jacked up with muscles like weightlifters. they're just sort of in-between, skinny but muscular at the same time. you can also tell who're the triathletes because they enjoy writing numbers on themselves with markers and they're not shy about wearing skimpy running outfits, male or female. less than 30 minutes later eliza came back from her run. i caught up with her after the finish line, the strange thing was she didn't look tired. eliza found her roommate, who was also doing the triathlon. she too looked remarkably untired for someone who's just been swimming, biking and running. eliza went off to find something to wear, and her roommate and friend went to go check out the elite athletes. after losing everyone, i decided it was time for me to go home, maybe catch up on some sleep after only 4 hours of winks last night. i admired some of the buildings, it's been a while since i've been down at that end of town. there was a new building, office or hotel i'm not sure, but it had a cool curving spaceform architectural design to it. i gave eliza a call on her cellphone, leaving a message to let her know i was going home. she called me back minutes later with possible beach plans (although with the weather cooler than usual, that would not be the case). i took a bit of a detour getting back to south station, so i could catch a glimpse of the newly demolished I-93. boston seems so empty now without that green monstrosity of an elevated highway. from a certain point near south station you can see not only most of the tall buildings in the financial district, but also the prudential and hancock towers in boston's back bay. 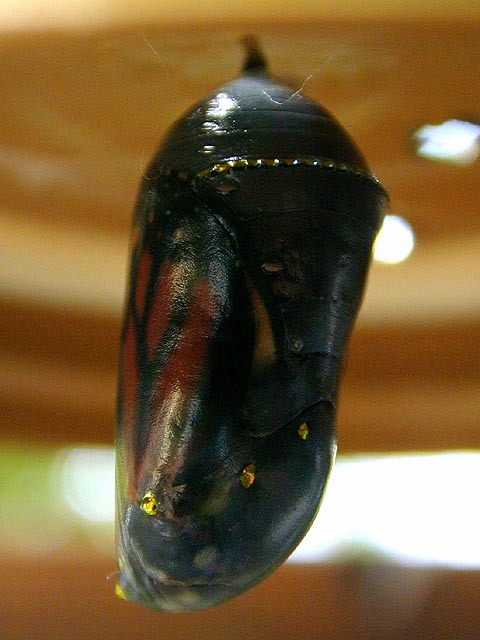 when i got back home, i was happy to see that my butterfly chrysalis had not hatched yet, although it had turned significantly darker and more transparent. the wings were now clearly visible and i could see the polka dotted pattern on the butterfly's thorax. i figured definitely tomorrow morning a butterfly would be hatching. after having one of those microwaved chicken pot pie pockets, i nestled on the couch with a bag of potato chips and a can of soda and fell asleep watching the red sox game. i felt cold, a sign that the summer seem will soon be over. my phone rang and it was mike lee calling to let me know that he was moving in, and as a matter of fact, he was outside as we speak. i let him in, he and his girlfriend wendy moved some stuff from her car into his bedroom, which i tidied up the house, my head still throbbing a little bit from having suddenly been pulled out of sleep. they left soon afterwards, leaving me once again to my own devices. around early evening i went into the kitchen to check up on the chrysalis. to my surprise, it was empty. 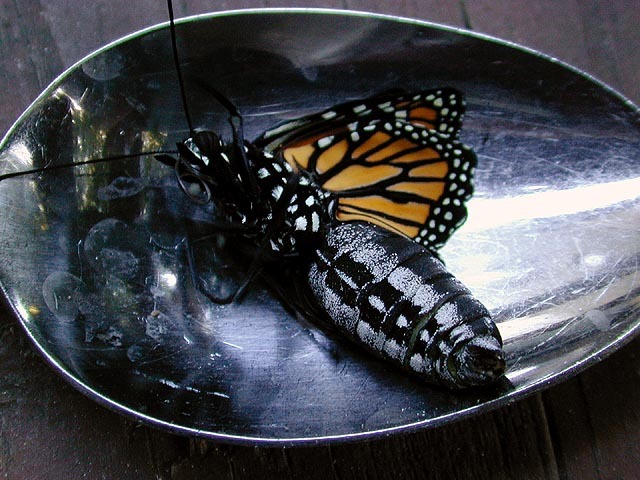 below the cracked chrysalis shell was a newly hatched monarch lying on its back on the kitchen table. it was kind of shocking, the newly hatched butterfly looked nothing like a butterfly, nor the shriveled up version i had thought i'd see. rather, it looked kind of like a fat caterpillar with little soft monarch wings. i was afraid to pick it up with my hands and used two spoons to scoop it up. it's kind of strange, but butterflies are suppose to hatch in the mornings so they have the day to dry out. this one was hatching in the evening, which was unusual. i quickly tried to put it on my jasmine bush, figuring it'd make a great perch. 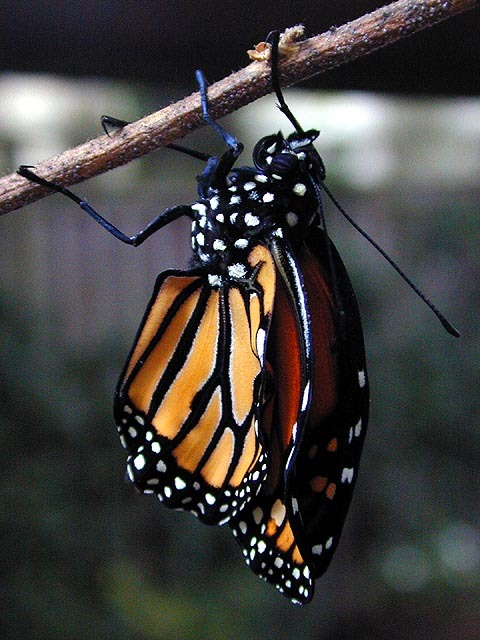 the butterfly hung on tenuously, and then suddenly fell off a leaf, hitting the wooden deck, then slipping between the crack of two planks down to the dirt floor underneath. i quickly crawled under the deck to retrieve the butterfly. i found it and realized it had suffered a fatal wound, rupturing its soft abdomen, vital body fluid leaking out. nevertheless, despite the bleeding, it was still alive, and i found a twig for it to cling onto and stuck it in a pot of dirt. 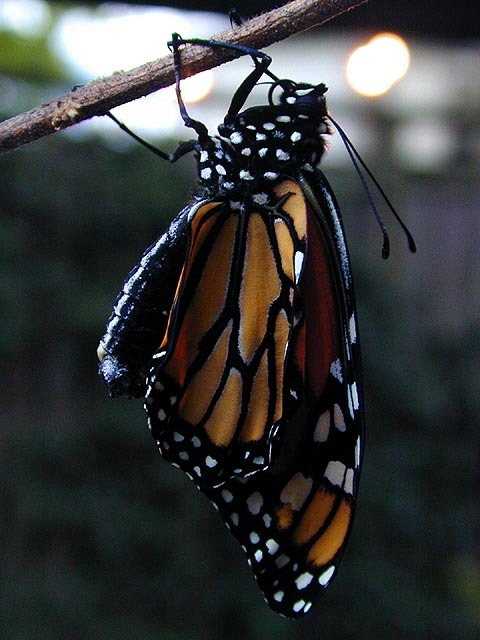 the butterfly, a male, tried desperately to open up its wings, but with body fluids leaking out, it didn't have enough internal pressure to inflate its wings, and will eventually die from starvation, unable to fly. friends, i have killed my second butterfly. one thing i've learned, BUTTERFLIES DO NOT LIKE TO BE DROPPED. 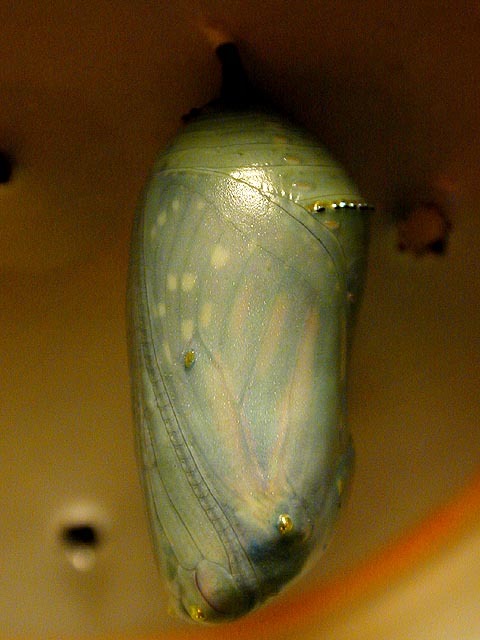 i still have one more chrysalis which will hatch either tomorrow or the day after. for dinner, i made french breach pizza. bruce, back in town for a week taking a secret vacation from work, dropped by so he could see the conditions of my two butterflies, one dying, the other still a chrysalis. he apologized for ever saying that butterflies are so easy to take care of, "even 8 year olds can do it," in light of my two recent butterfly deaths. 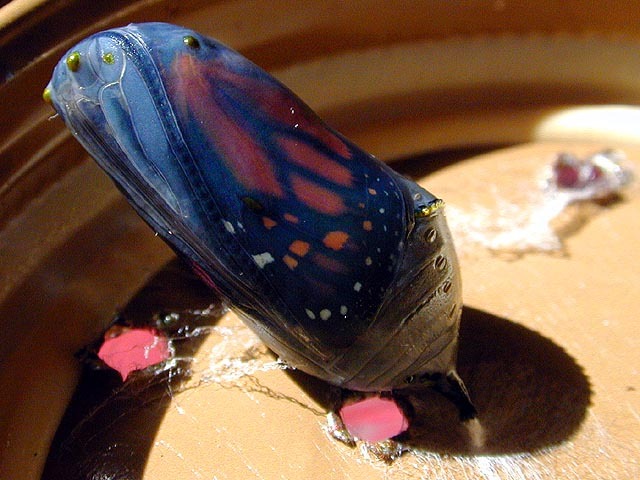 he noted that a butterfly hatching at night is kind of weird, and the fact that it fell off the chrysalis instead of hanging on to it to dry was another weird behavior. with clear skies, at 11pm i rode back home so i could take a peek at mars with the telescope. it was 60 degrees but on the motorcycle it felt like 40 degrees and i was shivering all the way home. my parents had just gotten back from a day trip to new york city via the chinatown bus, returning with bags of goodies. i hauled the tripod and the telescope into the backyard and set it up for viewing. it's been a while since i did any astronomy and each time i do it, the trees in the backyard get higher and higher, and i get less and less a view of the southern sky. mars, as advertised, was bigger than usual, about the size of the usual viewing diameter of jupiter, if not bigger. in the 8" lx2000 telescope from the suburban backyard of belmont with moderate light pollution, mars appears to be a tan colored globe with a swath of darkish brown across its center and highly visible polar ice cap in the south pole. i've never seen mars with so much detail, in the past it was just a small reddish ball with no discernable details. once the clouds rolled in and the mosquitoes started biting, my father and i moved everything back inside again. i took a bag of food and rode back home, just as cold the first time around.